Walter Rane's "Good Tidings of Great Joy"
I know it can feel a bit like déjà vu to read Matthew 2 and Luke 2 only a couple of weeks after Christmas, but that’s the Come Follow Me assignment for this week. The good news is there’s actually a lot more in Luke 2 that you probably don’t usually cover in your rehearsals of the Nativity at Christmas-time. So taking the time to read the whole chapter has it’s pay-offs. One of the things the manual for individuals and families invites us to consider is the humble and lowly circumstances into which the Savior was born. If your family is anything like mine, you may have recently participated in a reenactment of these events for an FHE a few weeks ago around Christmas. As we typically tell the story in our culture, there’s an innkeeper (or perhaps multiple innkeepers) who turn Joseph and Mary away, leaving them to settle in a stable (perhaps offered to them by the innkeeper) in which to be born. The Greek translated as inn is katalyma—a word that can refer to an inn, but more commonly is used to refer to a “guest room.” Most Jewish homes at this time had an upper room for guests and visitors to lodge in. It’s likely that Joseph and Mary were planning to stay in the guest room of kinsmen in Bethlehem, but they were already hosting other guests. Lacking room in the guest room, their kin probably invited them to stay in one of the lower rooms (or, in some cases, a cave below the home), where the animals were often kept. There, Jesus was born and laid in a manger. The individuals and families manual also invites us to explore the stories of the different witnesses of Christ found in Luke 2 and Matthew 2—the Shepherds, the Wise Men, Simeon, and Anna. Shepherding was evidently a lowly, even despised profession in the ancient Near East. Thus, most commentators contrast them with the wealthy and intellectual wise men of Matthews story, suggesting that Luke’s message here is that the “good news”—i.e., the gospel—is for the poor. While this is likely true, it also noteworthy that there is a lot of royal and messianic symbolism in shepherds. In ancient Babylon, Egypt, the Greco-Roman world, and Israel itself, the shepherd was used as a metaphor for gods and kings who were benevolent, caring for their people as a shepherd cares for it’s flock. Jesus himself was known as the “good shepherd” for this very same reason (albeit, in the gospel of John, not Luke). Furthermore, several of the major heroes of Israel were “shepherds” by occupation—Abel, the first martyr, was a shepherd (Genesis 4:2); Abraham, Isaac, and Jacob each had flocks of sheep (Genesis 24:35; 26:13–14; 29:6, 9; 30:40); Joseph and Judah and their brothers tended to their fathers flocks (Genesis 37:2, 12; 46:32–34; 47:3); Moses tended to Jethro’s flocks—and was doing so when he first saw God on Sinai (Exodus 3:1); and of course David, the key ancestor of the Messiah, was himself a shepherd right in Bethlehem (1 Samuel 16:11, 19; 17:15). It’s thus highly appropriate that the first witnesses of the new born Messiah—the good shepherd—were themselves literal shepherds from Bethlehem. One more thing about the shepherds, from discussing this story with my wife (so she deserves at least half the credit here): they appear to be introduced into the divine council. A typical divine council scene will consist of the Lord sitting upon his throne, with gods or angels surrounding him in council or singing praises (see, e.g., Isaiah 6, 1 Nephi 1:8–14). It’s noteworthy that first a single angel appears, and then the multitude—the rest of the council (2:9–14). Some divine council scenes involve a first encounter with an individual member of the council who then inducts the person or persons into the council. There is, of course, one important element missing—the enthroned Lord. The most immediate explanation for this absence is provided the angel’s own message—the Lord can be found not in a glorious throne in the heavenly realms, but as an infant child, lying in a manger (2:11–12). This contrast of expectations for a divine council scene further emphasizes the humble circumstances into which the Savior was born. And, since the divine council is frequently tied to temples and temple imagery, it’s at least interesting that the shepherds are given a sign by which they can find—and thereby enter into the presence of—Christ the Lord (2:12). 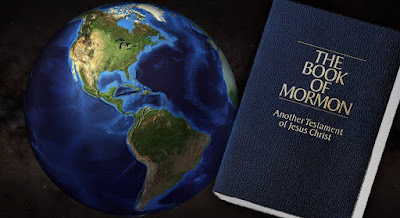 But the main point I’d like to make is that the purpose of inducting humans into the heavenly council throughout the Old Testament is make them witnesses and messengers of the Lord to the people. So Luke, through divine council imagery, is underscoring the role of the shepherds and witnesses. In Nativity reenactments, we typically skip over to Matthew at this point and tell the story of the wise men. But the circumcision, presentation of the child to the Lord at the temple, and purification of Mary, all recorded by Luke would have chronologically come first. It’s while they are at the temple that we learn of Simeon. Little is actually known of Simeon, except that he was a devout Jew who received a promise that he’d live to see the Messiah (2:25–26). He’s presumably an elderly man. 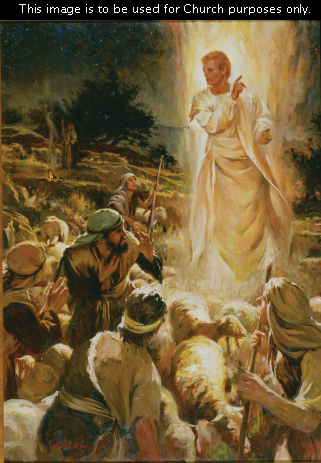 He was at the temple that day by spiritual prompting (2:27), and evidently recognized the Christ child instantly. Taking the child in his arms, he’s inspired to utter a blessing, in the which he states that Christ will be “a light to lighten the Gentiles,” as well as “the glory of thy people Israel” (2:32). Thus, one of the messages of Simeon’s story is that the gospel is for all people (see 2:31)—Jew and Gentile alike. It’s also at the temple that they encounter the widow and prophetess Anna. We don’t know exactly what she said, but she too evidently recognized the Christ child and testified of him. As a widow, Anna represents one of the most disenfranchised demographics in the ancient world. As one of the early witnesses of Christ, Anna signals that the gospel will not just be for men, but for women, in general, and widows in particular. As such, she becomes a type and shadow for the many widows who show up later the gospel accounts and are blessed by Jesus’s power. And at last, we come to Matthew’s wise men. They stand in contrast to all of Luke’s more lowly witnesses. Wealthy and intellectual, they bring gifts fit for a king. Most scholars believe that these wise men (Greek magoi) from the “east” (2:1) were Zoroastrian priests/astrologers from Persia. Others think they might have actually come from South Arabia, where incense and myrrh came from. Either way, they are often thought to be another witness that this Messiah mattered to more than just Jews—his gospel was for the world. Naturally, given their more elite status, they represent what the child was to grow to be—the priest and king of God’s covenant people. This is symbolized in their gifts—gold representing his kingship, and frankincense his priesthood. The myrrh, often used in embalming, foreshadowed his death and resurrection. How does this change our perspective on this question? While there no doubt are many good and important ways to be about the Father’s business, perhaps one of the most important ways for us—and for our youth—to be doing the Father’s business is by being at the Father’s house, performing sacred ordinances for ourselves and for the dead. Anyway, that’s enough of my musings on these chapters. Once again, I hope I’ve given you enough to think about and helped you see in one way or another how there’s a lot more to get out of these chapters than a simple reenactment on Christmas Eve will usually provide (as fun and wonderful as such reenactments most certainly are). Once again, I’d like to encourage everyone to take some time this week and themselves consider what can be learned from different all the different witnesses of Christ’s birth, or the humble circumstances of it, or the Savior’s young adult experience at the time, or any number of interesting topics to reflect on in connection Matthew 2 and Luke 2. On the widows in the gospels, it’s worth checking out Camille Fronk Olsen, Women of the New Testament (Salt Lake City, UT: Deseret Book, 2014), 139–149. Anna is covered just before that, on pp. 133–137. Nonetheless, some have wondered how these foreign dignitaries would even know about the coming Jewish Messiah or why they would care. If they are from Persia, they may have known (or been descendants of) Jews who remained in Babylon after the exile. If they are from South Arabia, Yemenite Jews have been in the region since at least the early centuries AD. Some of their traditions tie their origins back to Israelites fleeing the invading Babylonian army in the early 6th-century BC. Latter-day Saints should be reminded of Lehi and Nephi in this regard, and might even speculate that it was their prophesying in the wilderness that was remembered by the wise men 600 years later (see 1 Nephi 10:4). This would, of course, just be pure speculation, however. Check out the article from the December 1990 Ensign by Joseph Fielding McConkie called the "Twelve Witnesses of Christ's Birth". He actually lists 12 witnesses to the Nativity from Matthew and Luke. Great stuff Neal. I've never heard the divine council connection. Thanks. Neal - thanks for sharing your perspectives on the new curriculum. Really appreciated your points on Luke 2/Matt 2 and looking forward to future weeks!